12 Feet of hyperventilating fun! Are there any occasions where a 12-foot Beach Ball isn’t appropriate? When you’re looking to get a little frisky and want to liven up the party, break out the Giant Inflatable Beach Ball and let the fun begin. Your beach party will take on a whole new dimension as people begin tossing around the Giant Inflatable Beach Ball. It monstrous size can envelope small children and probably kill little woodland creatures and that’s fun for everyone. When you’ve got the itch for a party game that doesn’t involve a donkey tail, break out the Giant Inflatable Beach Ball and prepare for a HUGE dose of awesome. What happens when you have a ball that’s twice as tall as you are? Besides having the best time of your life, you’re grabbing on to the vigor and fun of your childhood. You remember playing with rubber balls as a kid and how much fun it was. Now, we have given that back to you, only much bigger and better than ever. Who would love The World’s Largest Beach Ball? 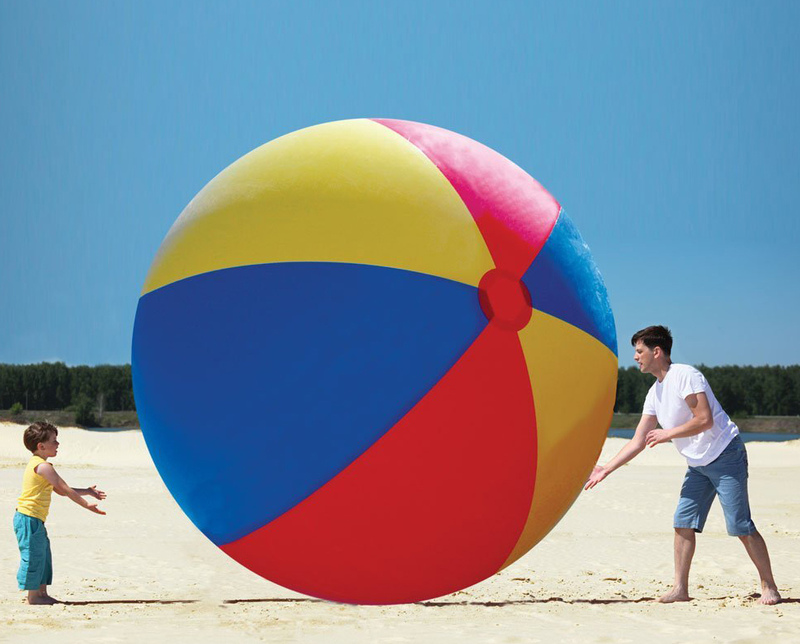 Anyone who likes to have fun or spends time out on the beach will love this massive ball. You’ll need plenty of room to play with it, so there’s no chance this is an indoor activity. This gargantuan beach ball isn’t just great for adults, but kids too. It’s larger than life family fun that everyone can enjoy. Is this a giant’s beach ball? While a giant of the Jack and the Bean Stalk variety would no doubt have a ton of fun playing with this beach ball, it’s actually meant for regular people like you and me. We love everything bigger, so why not supersize your beach ball? You’ll never lose this one on the beach! Can I use it like a regular beach ball? Absolutely, although, if you’re planning on using it for some water volleyball, you might need some herculean strength. It is, after all, twice your size. If there is one motto here at Fun Slurp, then it’s Go Big or Go Home. The World’s Largest Beach Ball is the biggest available, so we want to make sure our customers have access to this Godzilla of beach fun. Use it to literally crush the competition in a friendly beach game. It’s how we roll.